For those who love Kdrama/Kpop and travelers working with their laptop, laptop backpacks for you! Introducing the Targus' Seoul 2017 Collection laptop backpacks with refreshing colors, a solution to travel, work, and play, indeed. The Seoul 2017 Collection has a capacity of up to 25 liters and weighs in at 0.63kg. This series incorporates slimmer laptop and tablet pockets engineered by Targus®. 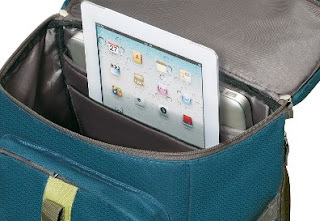 A dedicated compartment is designed to fit either a laptop up to 15.6” or a 15” MacBook®. The 12.9” iPad Pro™ or other tablets can fit into the tablet pocket snuggly. The Seoul 2017 Collection has an adjustable and retractable shoulder straps are fitted to allow adjustment according to one’s preference. The Seoul 2017 Collection features a 200D nylon dobby to finish off with a modern and stylish outlook. Exclusively on the 15.6” Seoul Backpack, a high-quality D-ring and extra bottom padding are used to provide extra protection. Water-resistant on the shell fabric and bottom base, commute worry-free with a durable body material.